I finally did it! Admittedly, I do have an addiction to chips and salsa but have really had to hold back because of the sodium level in my favorite “medium, chunky” salsa. For years I have tried various recipes to make my own low-sodium blend and have never been satisfied with the texture, the taste, or both. But lo! 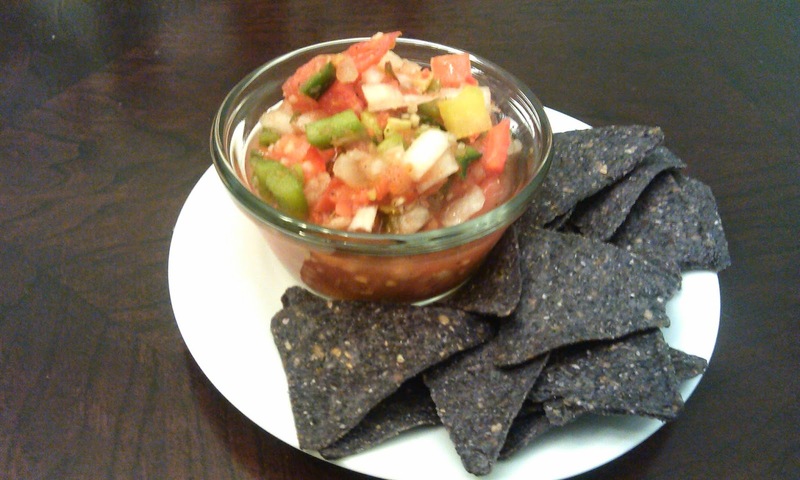 Now I have finally come up with a very easy and fast way to make great, nearly sodium-free chunky salsa and do it without all of the chopping, which is difficult to impossible for me if I’m suffering a flair-up. And that is it! The miracle of delicious, nearly sodium-free chunky salsa made from wholesome, raw, fresh ingredients and without the joint-searing task of chopping veggies (thank you produce department!). I have been experimenting with adding garlic and fine tuning my flavor, but we now keep this salsa in our refrigerator and I can enjoy at least one half of my chips and salsa addiction without blowing my low-sodium diet.